Many of you are likely already familiar with the alleged facts in the disturbing and complicated case of Captain Robert Semrau. For those who are not, here’s a quick refresher. Capt. Semrau was serving a tour of duty with the Canadian military in Afghanistan. He was assigned to a small Operational Mentor and Liason Team (OMLT) tasked with working hand-in-hand with a larger force of Afghani military assisting them in becoming a self-sufficient fighting force capable of challenging the Taliban militia on their own when Canada’s mission comes to a close. On Oct. 19, 2008 his orders were to troll Helmand Province for Taliban and engage with deadly force. Capt. Semrau and his team found exactly what they were looking for and were soon engaged in a firefight. Back-up was called and a pair of U.S. Apache attack choppers sprayed the area with 30mm cannon fire. Pressing forward, the solidiers came upon two of the victims of that fire. One was clearly dead. The other was described as lying in a pool of blood with a gaping hole in his back “the size of a dinner plate”, one leg pock-marked by shrapnel tenuously attached to what remained of his foot, and “a fist-sized laceration to his stomach”. The OMLT soldiers and their Afghan counterparts were still in the field with little knowledge of how many Taliban remained in the area. Medical evacuation was not available. What happened next is the subject of great scrutiny at Capt. Semrau’s military trial on charges of murder. Prosecution witnesses differ on a number of salient points but all seem to suggest that Capt. Semrau then fired two shots at the fallen Taliban, ending what little was left of his life. These same witnesses are equally unanimous in their explanations for Capt. Semrau’s alleged actions: mercy killing. As a criminal lawyer, a quick review of this case’s outline reveals many of the usual defences that can arise in criminal trials: no body was ever recovered leaving a serious absence of forensic evidence and witnesses appear to rely heavily on uncorroborated hearsay while conflicting with each other’s statements. However, in the unique facts of Capt. Semrau’s case, the greatest challenge faced by the prosecution may not be in proving its case beyond a reasonable doubt, but in maintaining moral legitimacy when imposing the obligatory life sentence for murder upon a decorated soldier who, if found guilty, would be responsible for an apparent mercy killing of an enemy combatant. 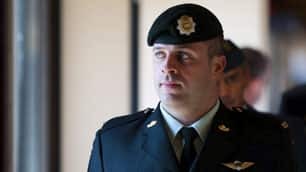 The lead prosecutor in the case, Lieutenant –Colonel Mario Leveillé, has been quoted as saying, “It is shockingly unacceptable and it is the type of behaviour we could not accept in Canada.” Although referring to the conduct of Capt. Semrau, one could be forgiven for thinking that the same could be said for a legal system that would sentence a soldier in these circumstances to life imprisonment. The case has a chillingly personal dimension for me. As I have written before, one of my colleagues is right now serving in Afghanistan in the very same capacity as Capt. Semrau was — deployed in a Canadian OMLT. Like other scribes who have written on this tragic story, I am reminded of the sardonic words of Frances Ford Coppola’s Captain Willard in the Vietnam opus, Apocalypse Now, when he opines “Charging a man with murder in a place like this is like handing out speeding tickets at the Indy 500.” Are we asking the five-member military jury in Capt. Semrau’s case to play the proverbial speed-trap cop at an Afghani Indy 500 race? When the American helicopters opened fire on the Taliban position, their intention was clear; their goal indisputable. Kill. This goal was achieved in the case of the first insurgent and, based upon the evidence available, appears to have been well on its way to succeeding in the case of Capt. Semrau’s insurgent. Wherever one falls on the ultimate question of whether mercy killing a dying enemy in theatre constitutes murder, even those most disturbed by the alleged actions of Capt. Semrau find themselves nauseated by the thought that this 36 year old soldier could spend a minimum of ten years in a federal penitentiary awaiting his earliest parole eligibility while his two daughters grow up without him. Canadians have grown sadly accustomed to seeing young children weeping graveside as caskets draped in the maple leaf return too often from Afghanistan. Watching a once-proud father through the grill of a prison’s bars is a fate arguably worse than death. It attaches a level of opprobrium and a stench of stigma that ought never to apply to someone found guilty of the facts in this case. Ivory tower academics and arm-chair writers (like myself) can debate for eons whether Capt. Semrau’s alleged conduct is a heinous crime, a moral failing, or a brave act of mercy towards a foe on death’s door-step. Regardless of where you fall on the question of whether ‘mercy killings’ are criminal, the lack of flexibility in the sentencing of this offence highlights important lessons that can be applied to a broader spectrum of criminal law policy. First, recent Tory amendments whittling away at judicial discretion in sentencing by increasing the number of offences subject to mandatory minimum penalties will only create new and more tragic examples of cases where a manifestly unjust sentence is required by statute. Capt. Semrau’s case is but one example of the disproportionate effect mandatory minimums can have in mercy killing cases (the circumstances of Robert Latimer and his severely disabled daughter also come to mind). Second, the rarely discussed spectre of jury nullification has the potential to nudge its way into the Semrau case. Simply put, jury nullification refers to the phenomenon of jurors flatly refusing to apply a law in circumstances where society’s view of criminality differs from that of our Criminal Code. The most famous example of this oft unspoken jury behaviour dates back to the numerous abortion prosecutions against Dr. Henry Morgentaler. It was undeniable on the face of the evidence that Morgentaler was brazenly and repeatedly violating Canada’s anti-abortion law (since repealed) yet jury after jury refused to register a conviction. The dynamics of the potential for jury nullification in the Semrau case are particularly intriguing as a number of factors mingle together making it very difficult to accurately predict what may happen. In a charge of murder, the jury is painfully aware of the only sentence that can follow a guilty verdict. This adds a tremendous pressure upon the jury who cannot take comfort in thinking that their verdict will be tempered by a merciful sentence. However, it is difficult to conceive how a five-member military jury (contrasted with the normative twelve-person civilian juries) would be prepared to deviate from the letter of the law. After all, being themselves career military men and women, these jurors are deeply inculcated in a culture of precise application of orders through their chain of command. To knowingly thwart the application of a law, even where that law may run afoul of blurry concepts of justice, may well be beyond their scope. And so, legal observers are left to watch as the trial continues. When soldiers are sent to war with orders to kill, the line between a job well done and murder can become easily obscured by the Afghan sand blowing across the valleys of Helmand Province. This story is sad all around, most especially for our justice system. I take it the odds of a jury nullification are pretty slim here. How are they going to prove the insurgent wasn’t dead when Semrau shot him? My impression was that no one was present when he was alleged to have fired the two shots, and those nearby believed the insurgent was at best minutes away from death. Semrau could easily have inadvertently shot a man who was already dead. Even with others were present and thought he was still alive, there’s probably room for some reasonable doubt about whether they could tell whether the insurgent was already dead. Captain Semrau was acquitted today of murdering a wounded Taliban fighter, but found guilty of disgraceful conduct. Someone who shoots a dead insurgent can indeed be convicted of attempted murder if that person had the intent to kill and committed an act that the person believed would result in death. Given the actual verdict reached, does the author stand by his comments about jury nullification in this case? Sorry for only noticing your comment so long after it was posted Old_Salt but I did indeed watch with interest as the jury returned its verdict of not guilty on murder and guilty of disgraceful conduct. It strikes me that the military jury DID indeed engage in a form of jury nullification. If the jury accepted that Capt. Semrau fired shots at the insurgent while he was still alive — which would appear to be the basis for the disgraceful conduct conviction — these same actions would sustain a murder conviction. The jury verdict appears to be an attempt to strike a middle ground in which Semrau’s conduct was censured but he was spared the disproportionate lifetime prison term that would have necessarily followed a murder conviction.